Universal Car Grey 12V 4 Doors Electric Power Window Lock Kit 4 Rocker Switch. 1x Five Button Window Switch. 3x One Button Window Switch. Compatible With: Fit for any cars(NOT fit for right hand drivecars.the motor interface must be twoline. ). 1997-2006 Land Rover Freelander. 3/5 Tailgate Window Regulator Repair Kit. Modifying an item in any way will void the warranty. We only warranty the cost of parts. Confirm the item(s) will install and operate properly before use or modification. 1997-2006 Land Rover Freelander. Right Rear Window Regulator Repair Kit. Modifying an item in any way will void the warranty. We only warranty the cost of parts. Confirm the item(s) will install and operate properly before use or modification. 1997-2006 Land Rover Freelander. Right and Left Rear Window Regulator clip. Modifying an item in any way will void the warranty. We only warranty the cost of parts. Confirm the item(s) will install and operate properly before use or modification. 1997-2006 Land Rover Freelander. Both Rear Window Regulator Repair Kit. Modifying an item in any way will void the warranty. We only warranty the cost of parts. Confirm the item(s) will install and operate properly before use or modification. 1997-2006 Land Rover Freelander. Left Rear Window Regulator Repair Kit. Modifying an item in any way will void the warranty. We only warranty the cost of parts. Confirm the item(s) will install and operate properly before use or modification. Part # CVH101212 . Freelander 01 - 06. Rear Window Regulator. LH - Left (driver side). CENTRAL DOOR LOCK AND UNLOCK KIT. COMPLETE WINDOW AUTOMATIC POWER KIT. Power window system is installed behind door panel. This kit will convert your current manual door locks to the convenience of power locks. 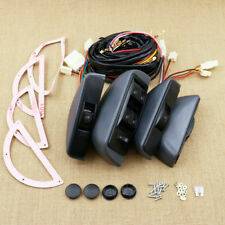 Convert your car or trucks manual style windows to automatic power windows with this conversion kit. This full complete window conversion kit will quick and easily add the luxury of power windows to your vehicle! VALEO 851151. LAND ROVER LR006371. LAND ROVER FREELANDER (LN) 1.8 16V 4x4 11/2000 -. LAND ROVER FREELANDER (LN) 1.8 i 16V 4x4 02/1998 -. LAND ROVER FREELANDER (LN) 2.0 DI 4x4 02/1998 -. LAND ROVER FREELANDER (LN) 2.0 Td4 4x4 11/2000 -. VALEO 851150. LAND ROVER LR006372. LAND ROVER FREELANDER (LN) 1.8 16V 4x4 11/2000 -. LAND ROVER FREELANDER (LN) 1.8 i 16V 4x4 02/1998 -. LAND ROVER FREELANDER (LN) 2.0 DI 4x4 02/1998 -. LAND ROVER FREELANDER (LN) 2.0 Td4 4x4 11/2000 -. 1 x Installation wire harness. 1 x switch holder (for 1 switch). Various switch types are available. Each switch is be with illumination green ligth. 1 x switch holder(for 2 switches). Suitable for window regulator. 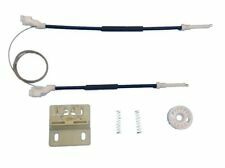 Universal Car Power Door Window Glass Lift Switch Harness Cable Sets. 1 x Installation wire harness. 1 x switch holder (for 1 switch). Various switch types are available. Each switch is be with illumination green ligth. 1set New Universal 12V/24V 3pcs Buttons Car Power Window Switches with Holder & Wire HarnessFor 2-Door Pickup Truck SUV Van Car. Complete wire harness. 1 x Installation wire harness. Universal power window switch. For BMW 525i 1989 E34 1990 M20; E34 1991-1995 E34. for BMW 325i 1992 M50 Eng. ; E36 1993 M50TU Eng. ; E36 1994-1995 E36. for BMW 735i 1987-1992 E32. for BMW 735iL 1988-1992 E32. for BMW 740i 1993-1994 E32 1995 E38. Car Truck SUV Flaming Skull Rear Window Tint Graphic Decal Wrap Back (147x46cm). Size: 147x46cm（57"x18"）. This Perforated Window Graphic is a simple and unique way to add just the right touch to your car. 【Non-slip Design and PVE Soft Rubber】-- Frosted surface provides solid and secure support for you standing on car doorstep folding ladder. Car Doorstep. Vehicle rooftop doorstep, a very useful travel tools! Complete wire harness. Universal power window switch. 1 x Installation wire harness. For 2 doors type. 1 x switch holder (for 1 switch). Various switch types are available. Each switch is be with illumination green ligth. Color: Limo Black. -Tint rear windows in your vehicle to protect pets from sunlight. remove protective film from tint - stick tape on both sides of corner and pull. apply tint with sticky side to the window using water. 1 Doorstep. Check your car latch is sideways, otherwise it may not fit for your vehicle. F.Foldable hook for easy storage in your car. D.Foam strip for preventing scratching, protecting car paint. H.Fit for Universal Cars with door latch in sideways CAR, SUV, JEEP, RV. When ACC ON, press the arming button, there is no response of the power window. You have to close or open the windows by manual switch. 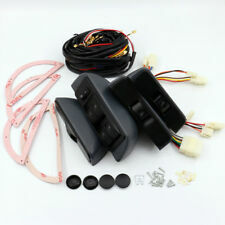 Automatic Window Closer For 4 Door Car Alarm System Power Window Roll Up Kit. 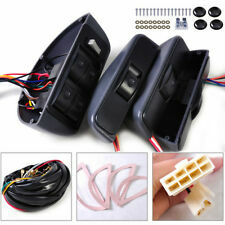 Professional Car Electric Power Window Switch & 12V Wire Harness Kits Universal. Complete wire harness. Universal power window switch. 1 x Installation wire harness. 1 x switch holder (for 1 switch). Various switch types are available.